Longlac is approximately half way between Toronto and Winnipeg, and is 320 kilometres from Thunder Bay. So for me, on one particularly longish trip, making it to Longlac was kindofabigdeal. So, for me at least, the oncoming arrival of Longlac was a big deal – finally, the end of this 200 kilometre stretch of nothingness…! It’s no surprise that the town’s Protestant church is named St. John-in-the-Wilderness. And it wasn’t founded in the fur trading days either – this was founded ‘in the wilderness’ in, wait for it, 1943. Today, Longlac is a former paper and forestry town trying to reinvent itself in a difficult economy and represents the westernmost edge of northern Ontario’s francophone belt – just under half its residents are French-speakers. Hence the local caisse. When you get into the town you’re immediately greeted by a horse statue and two beached boats. The horse is pulling logs (which you can’t see unless you climb up the little hill to the statue itself.) I think the boats are supposed to carry logs too. They seem to be the remains of a former miniputt course. It’s too bad it can be a bit confusing to the visitor. Longlac has a long history. Prior to 1800 the town was a North West Company trading post. In 1814, the Hudson Bay Company set up a rival post, and in the spirit of modern commercialism the two merged in 1821. There is a historical plaque with a statue of two guys in a canoe, representing the role of Aboriginal peoples and fur traders in building Longlac. There’s also a town history board back at the tourist office/former mini putt site. Longlac used to be a mill town but today, no mills operate in Longlac. All three have shut down in the last few years. “Founded on fur, sustained by the forest” is Longlac’s motto, and considering that the forestry industry is contracting in northern Ontario, you have to wonder what a town of 1200ish will find to sustain itself. What other jobs can there be in the area? How long before parents have to start working in Alberta? 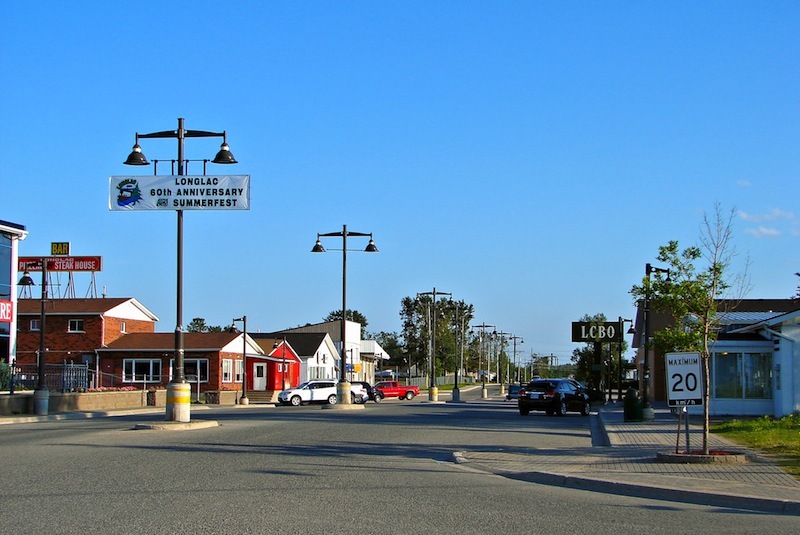 It is communities like Longlac that you really feel for – they’ve survived this long. Longlac’s main strip is Forestry Road, which runs perpendicular to Highway 11. It has a row of streetlights right in the middle of the road, which practically invites you to play a game of bumper cars with your vehicle. What happens if you have to swerve for a dog? Abandoned mini putt in Longlac, Highway 11. I thought the horse and boat belonged to the mini putt! Seriously? This is northern Ontario after all. I hope to visit again. Maybe someone can send me an email and let more know a bit more so I can add it here. This entry was posted in The Interior and tagged big weird things, boating, forestry, francophone by Highway11.ca Editor. Bookmark the permalink. I spent almost two years in Longlac 1966/7, as a child. My father was the local doctor (Dr Mainman). I’m planning a trip to Longlac to show my two teenage sons where I spent part of my childhood, and gained such vivid memories. Looking forward very much to seeing it again. I see that you were born in Geraldton, ON in 1953. I remember that your family used to live in the townsite, and I remember Michael. You must have known my cousin, Gordon Steinert in Longlac as he lived in the townsite, too. He was born in 1950. He lives in Cairns, Australia, now and has worked in Australia as a geologist since around 1980. I GREW UP IN LONGLAC BUT MOVED AWAY TO HINTON, AB IN 1980. I HAVE GONE BACK EVERY YEAR UNTIL MY PARENTS PASSED AWAY. 1995-2010. I WAS JUST THERE A FEW WEEKS AGO AS MY YOUNGEST SISTER GISELE, PASSED AWAY JUNE 21, 2010 IN LONGLAC WHERE SHE HAD RETURNED TO RESIDE IN THE LAST 6 MONTHS. I grew up in Long Lac but left to see what Western Canada was like, I ended up putting down roots in Alberta. I will be retiring soon and am looking forward to spending much of the time back in Long Lac the place I have always called home. I’ve been going to Longlac on fishing vacations for 40 years. I haven’t been able to go for the last couple of years and miss it very much. Used to stay at White’s Long Acre Motel, then Northwood Lodging, then at Lochlomond Camp. The people and scenery make Longlac the best place on earth. I feel sorry for the residents trying to make ends meet in such a lousy job market. I hope something happens to create the jobs they need, and soon. God bless you all. July-August 1962 I was in a Junior Forest Ranger Camp on Klotz Lake. It was in walking distance of Klotz Lake Camp and we would occasionally go over to pick up snacks there. From Google Earth, it appears that the JFR camp site is now owned by Klotz Lake Camp. (See a photo I put up a photo of the camp on Google Earth.) I remember trips to Longlac crowded into the back of a truck. Our favorite hangout was Ben’s Restaurant. Brenda Lee was usually the main choice on the jukebox. Once or twice we went to a community center to watch movies – it cost about a dime to get in. We were entertained by “The Little Rascals” and “Wind Across the Everglades.” Is Ben’s Restaurant still there? no have never heard of it. where was it located or what was around it. seriously, I am still good friends with the Breton’s but have lost contact with most everyone else. Wondering if anyone can enlighten me regarding POW camps in the area. My father was a POW for most of WW2 and had been at numerous camps throughout Canada. His diary mentions working for “Great Lakes Paper Co”,Hurket,ON, Black Sturgeon Camp 12. He enjoyed it there from Oct,1944 to Apr,1946. Prior to this camp he had worked in Nipigon, Camp 29. At that time he was paid 50 cents/bush cord as a cutter. Any info would be appreciated. I can be contacted by email. Thank you! You can find my aunty Johanne Ferris on fb. Hi everyone! Been reading the comments on Longlac! Very very interesting. My brothers used to work in the mines that way (Marathon), (White River) and i visited them there however was terrified of travelling the Trans Canada Highway. Now i was just wondering is there any funeral homes in Longlac or do you know of the one nearby as a friend of ours named Gaetan who lived in Longlac and worked there just passed away in a head on car collision on Friday. Just would like to see his obituary and pass it on to his beautiful friend who he met in New Liskeard this summer at our Biker\’s Reunion. he would be around 37 – 40. Does anybody have any information? If so would you please email me with the newspaper name and such. I would love to go visit Longlac and visit the POW camp, etc. one of these days. I found it very interesting in White River and Marathon. God Bless. Yes, Skinner’s Acre is still in business – Tim Skinner and his wife, Linda, run the place. 807-876-2245. I’d be happy to have you at our camp too – Klotz Lake Camp – 50 kms outside Longlac to the east. Good luck! Is Skinner’s Acre still in business in Longlac? Used to fish area lakes a long time ago. Enjoyed the people and the area. Hi I travel to long lac on occasion due to work, but anyhow I am wondering if anyone has heard of ghostly hauntings there or anything??? My friends and I have formed a Paranormal research group and are reaching out looking for haunted areas near thunderbay, our website is http://tbpra.webs.com any replys will help our group out very much. Check it out!!!! I love going through this town on the train. The lake is awesome. Just wondering if there is a cemetery in Longlac? apparently my grandmother\’s nephew worked in the Lumber mill and was told that he is buried in Steven\’s Ontario. Stevens isn’t far from here. There a couple cemetaries here. I would think the one in Stevens would be hard to find unless someone knew exactly where it was. I would imagine it is pretty grown in. On response to your request looking for information on your uncle Stanley McLeland….he is buriend in the Geraldton Grave Yard. Hope this helps you You oould contact the Geraldton Municipal Office at 808-854-1100 and ask any questions you may have and they should be able to direct you to the proper agency…Good Luck in your search. I visited Longlac this past October. My son was a teacher at Eagles Nest school and I decided I wanted to see him in the classroom and spend Thanksgiving with him. I fell in love with this town. The beauty of the landscape was absoutley stunning. I met some wonderful children at the school and am hoping that they will do well in school. I am hoping my son will go back to Longlac and teach as I would love to spend another Thanksgiving in the north. I don’t know about that ! Long lac has changed a great deal. Hi Tom Childs. There were work camps throughout the North, many North of Hurkett and near Nipigon. A friend of mine has a hand carved wood model of the Bismarck in a glass case made by the prisoners and given to his father who was a guard at the camps. Tom, spoke to Mr. Mengleberg, he confirmed that they did indeed build canoes at his POW camp. He would have worked on them himself. You should contact him. email me at sylvie-lemieux@sympatico.ca. There was more than one POW camp around Longlac during WWII. One between Geraldton and Longlac and the other down Long Lake. I have walked into the one between Ger. and Longlac. It is entirely possible that POW’s built a canoe as Paul M. can tell you that at the camp down Long Lake they built a small sail boat. Trying to track grave or info on Mabel Pearl Richardson nee NEWTON, born 1899 or 1900 in Otter Lake QC, died 1941 of TB unknown location. Heard that her NEWTON family may have moved from Otter Lake to Longlac or possibly Kapuskasing early 1900′s. Thanks for any info. Hi – I\\\’m trying to find out some information about my father, Gunther Rehfeldt, who was a prisoner of war in Canada from late 1941. I have some of his photos from the time he spent in Long Lac working in the logging industry. But now he has passed away I can’t ask him what year he was there and other details about his time as a POW. I know he did spend time at Medicine Hat too. If anyone has any information I would really appreciate it. thanks. just letting you know that there is a Longlac resident who could help you. His name is Paul Mendelberg. He was a POW at the camp you refer to. He is a very healthy 90+ year old fine gentleman originally from Cologne Germany, still living here in Longlac with his lovely wife Aggy. I am certain he will be happy to answer your questions and have a good old chat about his experiences in this camp. I was born in longlac(actually Geraldton) in 1942 to Alex and Sadie Galloway,both deceased Alex was employed by the Spruce Falls aka Kimberly Clarke until some time in the late 50`s when we relocated to Toronto.The tugs were used to haul rafts of logs to the saw mill and to terrace bay which was built by Spruce Falls to manufacture pulp for newsprint Check out the Terrace Bay website.. The horses were used the BUSH to haul the fallen trees to haulers etc. I have maintained that the years I spent in Longlac were some of the best of my life. What a wonderful place to spend one`s youth.Longlac was indeed the home for some POWs who were kept in tow by the black flies and other wild life. I also note that the galloway house on the lake was for sale a year or so ago nice place. Please help,I was born in Longlac in 1948 to Jim and Christine Mary Peters(nee Finlayson).I am currently looking for any family members.Looking for Richard Finlayson/Peters son of Christine Finlayson,Oliver Finlayson brother to Christine,Daisy Finlayson sister to Christine,Joe Finlayson.Lived on the Reserve in the mid – late 1970\’s. Christine\’s aunt Flossy Luloff passed away in the late 1970\’s.Any info would be of great help. Hello, I grew up in Longlac On and moved away in the late 90′s. A lot of Finlaysons still live on reserve 58. I’m sure if you contact the band office at Longlake Res #58 they can help you to which relatives are still there. My history isn’t the greatest as I’m of the younger generation than my siblings. I remember Oliver, Joe, Steve, Josephine who have passed on. But have a lot of family members. Hope this helps. Grant Waboose. Hi my daughter Heather and I lived there for about four years from 1999 until 2004. It is a nice little town with very nice people, we made a lot of friends. Also we had a dog grooming business and a small pet store. yes, there was definitely a POW camp just a few miles out of town in the bush. I remember seeing the POW’s on many occasions being marched through the town. I lived there from about 1943 to 1952 and at that time there were no street names. As for the industry, as of now all the mills are shut down. The street lights in the middle of main street, I agree stupid, and I really have no clue as to why the municipality did that. So far there hasn’t been any accidents. I lived in Longlac for 20 years, I now live in Ottawa where jobs exist, for now. Longlac has since shut down it’s third mill in January 2009. My father was among those who lost his job 2 years ago at Kimberly Clark, which had been taken over by an American company called Neenah Paper, when it came to contract negotiations, Neenah Paper put a deal on the table that they knew the employees would refuse, and so they went on strike. The Company took their pensions and left hundreds unemployed. My father has been lucky enough to find work, however, my parents have spent their entire life savings in the last 3 years trying to keep up with taxes and payments. Many have left their wives and children behind to make money in another Province, mostly Alberta. Things are still up in the air, no one knows what will become of Longlac. Anyways, you can contact the Town office by dialing 807-876-2316. They should have some information for you. I hope I was able to help a little bit. it didn’t really help that after the Veilleux’s raped and pillaged the forest they sold out to Bucannan who quickly shut it all down. by the way the Veilleux’s lost ALL their money in Ottawa and went back to Thunder bay with nothing. I am doing research for the Canadian Canoe Museum in Peterborough, Onario. Within our collection is a canoe reputedly made by german POWS from the Bismarck sinking in 1941.They were interned in Longlac, Ontario. I am trying to verify this information. My challenge has been to find if there was a work camp in Longlac during World War 2. Also how many prisoners were there. The official archives of both Canada and Germany does not give very specific information. If you can help me in two regards I would appreciate it. I cannot find a website or address to write to the Town of Longlac and/or a local paper to ask for information. Also do you have any information which might shed some light on this inquiry. The Canadian Canoe Museum has the largest collection of canoes and kayaks in the world. I thank you for any help in this matter. Hi everyone! Hi Mom! I just had to say that! Anyway Longlacs is a nice town, who\’s idea was it to put street lights and curbes down the middle of main street…that guy should be fired, what a stupid, stupid idea. So all or most of the companies are closed or on strike. People are trying to sell there houses some just leave. Some are waiting for that silver lining..I hope it\’s there! I hope the mines open up soon so that would create some much needed job. All n all Longlac is a nice place, I remember going fishing with Marianne. Her and I caught our limit every time we went fishing…them were good memories!